RapidLite is a tool for any public safety agency to access life-saving emergency data from the RapidSOS Clearinghouse. The Los Angeles Police Department (LAPD) deployed RapidLite in their PSAP for telecommunicators to access data from Apple, Google, and Uber during 9-1-1 calls. The RapidSOS team visited the LAPD PSAP to learn more about their process deploying RapidLite, training telecommunicators, and managing emergencies with additional data . Todd Austin, a Senior Police Service Representative with the Los Angeles Police Department (LAPD), and Stephanie Estrada, a Police Service Representative with the LAPD, spoke with us about the challenges facing telecommunicators and best practices for using RapidLite. Watch the video and read the full transcript from their interviews below! Q. Can you talk about the RapidLite tool and why it became an important tool for your center? A. One of the biggest challenges that a telecommunicator has is obtaining good location data. We would have to rely on cell tower triangulation technology, which has been challenging when trying to obtain a good location. It is also very time consuming, as it can take 30 seconds or longer to get a good Phase II location. When we learned about RapidSOS and their work with Apple and Google, we were immediately excited about the opportunity to be able to get help to someone faster by getting a better location right out of the gate, rather than relying on outdated technology. Q. Can you talk about what the process is like for your telecommunicators using RapidLite? A. I think for those centers that don't have the capability right now to integrate RapidSOS into their existing CPE or CAD equipment, the standalone RapidLite system is super easy to use. It's literally just typing in the phone number, clicking enter, and then all of the data that you need for that call is immediately displayed, including location data. In addition, if there's supplemental information, such as an Uber trip, that is also displayed on another tab, which is very easy to navigate. Q. What was the process like for your center to adopt RapidLite? A. We learned about RapidSOS at a local PSAP managers meeting. You folks came and did a demonstration for us. During that meeting I signed up for an account with RapidSOS. It was super simple and quick. Q. What type of 9-1-1 calls do you get and what percentage of them are wireless? A. So over 80% of the calls we get today are wireless. Oftentimes people hang up within the first 25 or 30 seconds of the call, so we don't ever get a good location on them. With RapidLite, that information is available instantly. It's transmitted at the same time the voice call to 911 is made, and we're able to punch in that phone number and get that location data immediately, whether or not that person hung up in the first 5 or 10 seconds of the call. Q. Did you have any concerns about using a web-browser tool? A. We have other applications where we use a web browser. Today we use a stand-alone system that's not connected with our CAD or our CPE, so those weren't really a concern. It's a secure website, and it's password protected. Q. Are you looking to integrate the RapidSOS Clearinghouse into your existing software systems? A. We're in the midst of upgrading just about everything here at LAPD, including our CPE equipment, our CAD system, and we're in a radio system upgrade. So, we are 100% interested in integrating RapidSOS into either our CAD product or our new CPE product — we think that's key in continuing our technological evolution at the LAPD. Q. How did you go about training your telecommunicators with the new technology? A. At LAPD, the training was pretty easy. RapidSOS provided a couple of different videos, which assisted us. We wrote up procedures and policies that we distributed to all of our employees. And, we conducted the training in a roll call setting. After five or ten minutes most people were able to log on to the system, and they were able to become familiar with it. It was not a huge challenge to train our folks, and we have more than 600 dispatchers here. Q.Have you seen any examples where RapidLite helped save lives? A. We recently learned about a suicidal caller who dialed 911 in our jurisdiction. She was depressed and she was thinking about ending her life. The location that we got on our ANI/ALI through the wireless provider was not a dispatchable location. However, on RapidLite we were able to get a very good location. We dispatched officers out, and they were able to locate this person. They were then able to provide her the help that she needed. Q. Can you speak about location when it comes to texts to 9-1-1 and the challenges that come with it? A. A huge challenge for us and every other PSAP in the country is that the location data that we get on an incoming text is poor at best. With RapidSOS and their partnership with Google, we are now able to get location data on Androids. We actually just tested Android devices this morning here at our dispatch center. We sent a text to 911, and it pinpointed our location — not only the address, but the portion of the building in which we were standing. Super cool technology. Q. Has it been a challenge for telecommunicators to have both the RapidLite location and the Phase II location? A. When we receive calls where we do get two distinct locations, we dispatch an officer to each location just to make sure. We've seen that the location RapidSOS provides is far more accurate than the location we've been getting from the wireless service providers. However, to cover ourselves and to make sure that we're finding the person who needs help, we're sending officers to both those locations. Q. What’s the coverage like for your center? A. We cover over 460 square miles in the City of Los Angeles. That area has a population of well over four million people. We operate two dispatch centers: one dispatch center in our downtown metropolitan area and the other center out in our San Fernando Valley. We are handling more than four million calls per year. 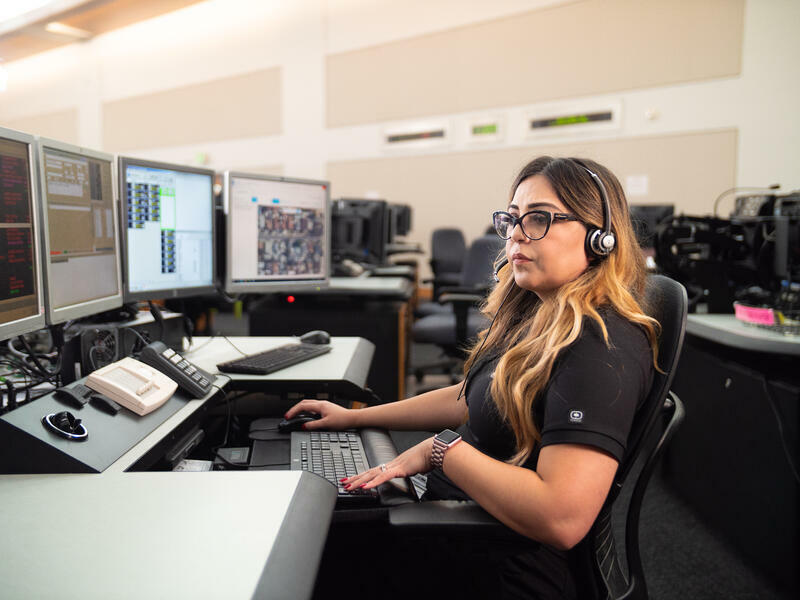 We have over 600 dispatchers, and we run sometimes upwards of 80 or more dispatchers per shift, depending upon the time of year and day a week. A. I would like to encourage any PSAP out there to take advantage of this technology. This is undoubtedly going to be life-saving technology. It's quick, it's easy and it's free. There's no reason for every PSAP in this nation to not take advantage of this technology. Q. Can you speak about an experience you’ve had trying to get an accurate location for a 9-1-1 call? A. Recently I had a caller who was irate and needed help. She was reporting domestic violence, but she didn't want to provide me her location. I took a look at her ANI/ALI and it wasn't a great location. So I queried it through RapidSOS and I got a location in front of a school within 6 meters. We were able to find her and get her the help she needed. Q. What would your message be to other PSAPS looking to adopt this technology? A. I would say totally go for it. The sign-up process is easy, it's free, it only takes a couple minutes to sign up, and you get approved within just a couple weeks. It's been really helpful and we're gonna save a lot of lives with this new technology. I encourage everyone to sign up for it. To learn more about getting access for your agency, you can visit RapidLite.com or request a free consultation with a member of the RapidSOS public safety team.